It made me feel really good that my friend said something so kind, of course, but it also got me thinking. And I realized that bold choices can come in many forms – whether moving across the country alone or starting your day with the boldest coffee around (more on that in a minute). In my younger, pre-kids life, bold choices meant taking risks in my life and business. It meant buying a 1978 RV and traveling throughout America during entire summers for several years. It meant moving to a Buddhist center on a whim and living and volunteering there for three years. It meant taking trips (on relatively short notice) to Australia and Europe. It meant moving to new cities and new states, often sight unseen. It meant starting an eco-friendly clothing line with $ 200 and a sewing machine set up on a cardboard box that ultimately led to showing at several fashion weeks, exhibiting at Chicago’s Museum of Modern Art, and being featured in prominent fashion publications like WWD. It meant excitement and uncertainty and lots of leaps before looking. It was great. These days, making bold choices means something much different. But it’s still great. 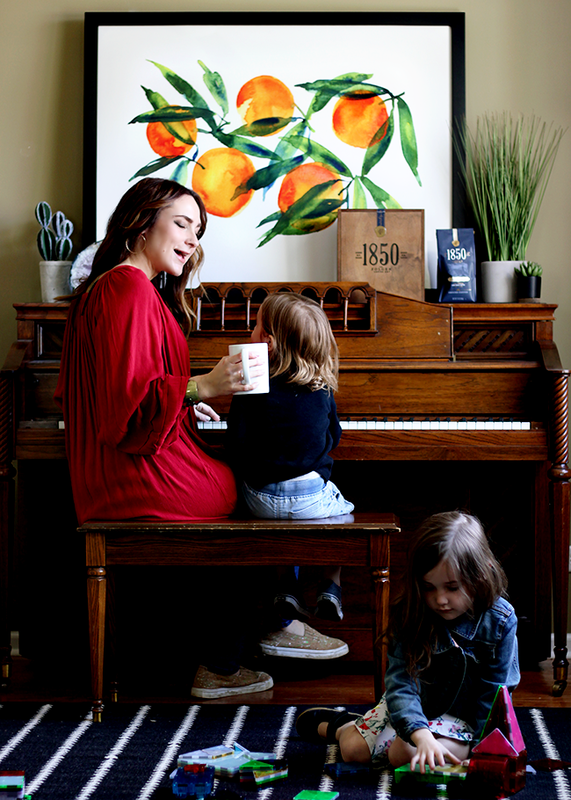 Making bold choices in this stage of my life means closing my clothing company and taking the leap to work from home – as a blogger – in order to be with my kids. It means leaving parent meeting with my mama girlfriends to go drink peach margaritas. It means finding new adventures with my little ones that involve things like choosing to take hidden paths deep in forest preserves off the trail, or choosing to drive an hour when it’s already almost bed time to get the best ice creams, or deciding on a Friday morning to take a four hour road trip to Indianapolis that afternoon. Sometimes it just means making the choice to stay in our pajamas for an entire Saturday or to have last night’s pizza for breakfast or to decide last minute to spend an afternoon building tile towers instead of doing “responsible things” like cleaning the house or finishing work. And your know what? These “less exciting” bold choices can be pretty profound, in all honesty. 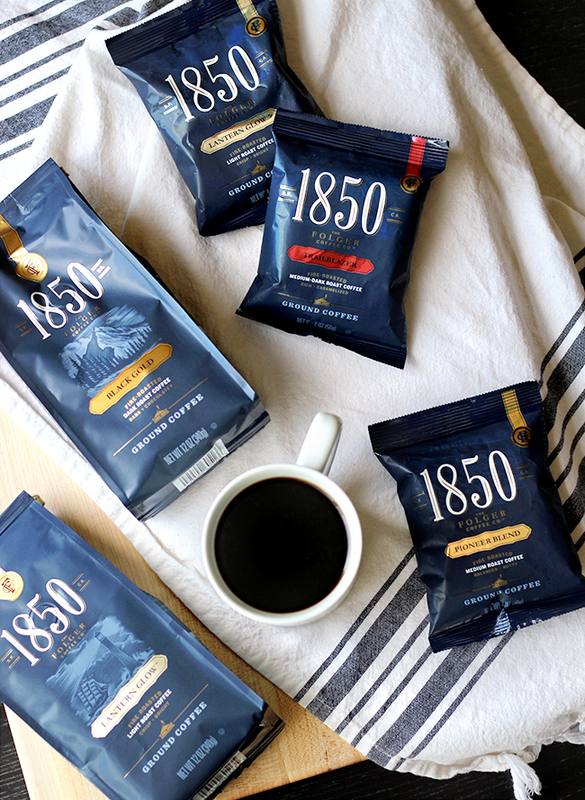 Another bold choice I make these days is to start my day with the boldest coffee around – 1850 Brand Coffee, a new premium coffee from the makers of Folgers. Yep, coffee. This delicious blend of ground coffee delivers bold yet smooth taste – it helps me start my day on a positive note, and inspires me to make bold choices throughout it. And it’s so good. 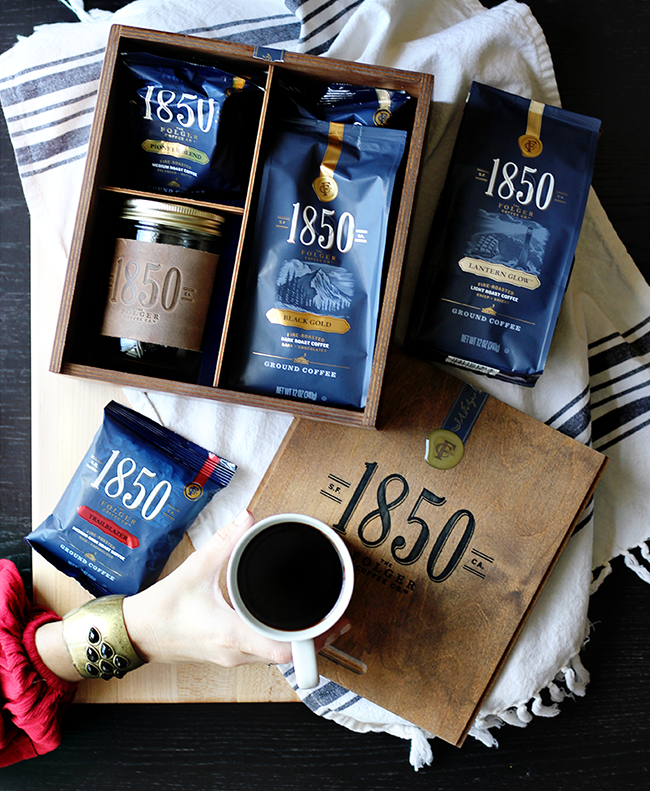 1850 Brand Coffee beans are fire-roasted and ground to help bring out its rich taste and aroma. The second I smell it brewing I feel motivated. The story behind is really inspiring too. Back in 1850 (hence the name! ), J.A. Folger started something new and innovative to help the prospectors as they sought their fortunes. And the Folgers company believes that there’s still no better way to get going than with a bold-yet-smooth cup of coffee. 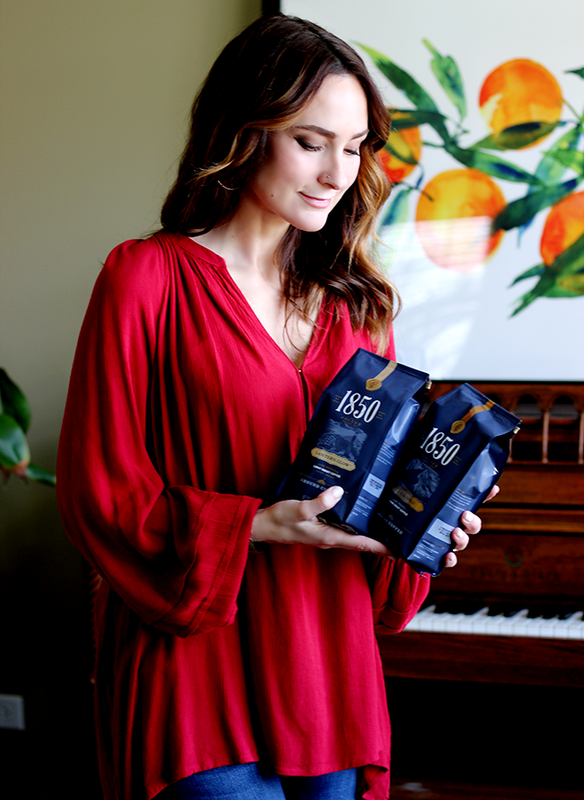 Out of this philosophy, 1850 Brand Coffee was born – and they have declared it the official coffee of “bold people fueling original ideas, new commitments, and brave endeavors.” In their words, it’s ”more than a coffee; it’s ally to the hustle.” I agree. Bold choices are a part of who I am, and I do solemnly swear to continue to make them for the rest of my life. 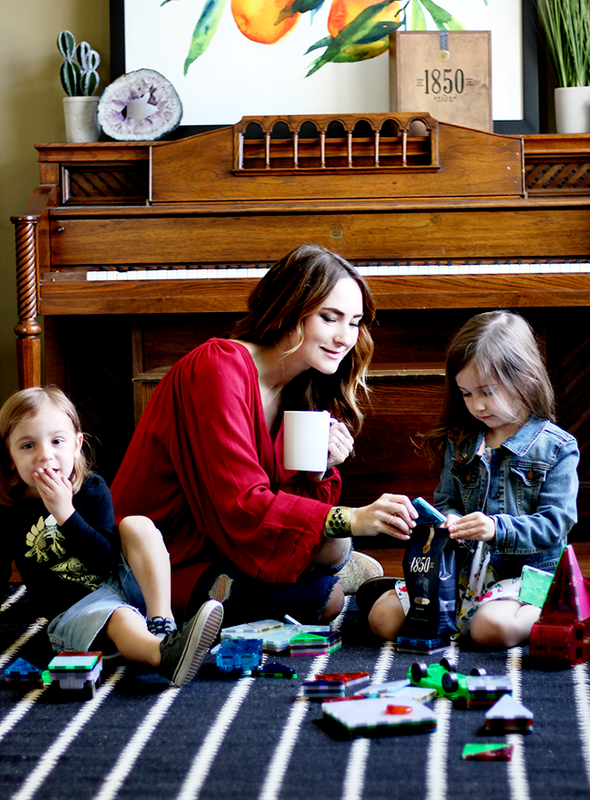 I swear to continue to respect and acknowledge all bold choices – from last minute around-the-world trips to staying in our pajamas all day to starting my mornings with the boldest coffee around. Speaking of which, if you want to try 1850 Brand Coffee for yourself (and you should), visit Meijer from 5/6 – 6/2 and take $ 1 off any 1850 Brand Coffee Product with the mPerk digital coupon (while supplies last). Pssst… You can shop the image above! Just hover over it and click. There is little in this world I enjoy eating more than Thai food. (Okay, tacos too, but you’ve seen enough recipes here involving those.) And when it comes to Thai food, I almost always go for curries. (Side note: red curry was the first dinner I ever made for my now husband, almost 12 years ago. Awww.) Lucky for me, everyone in my family (even the 2 year old) loves Thai curry dishes too. Not so lucky for me, these dishes usually require quite a bit of time and ingredients to prepare. You guys know me – I do not enjoy extravagant, time consuming recipes. So sadly, red curry was, for a long time, something I only made on special occasions (and never on weeknights). 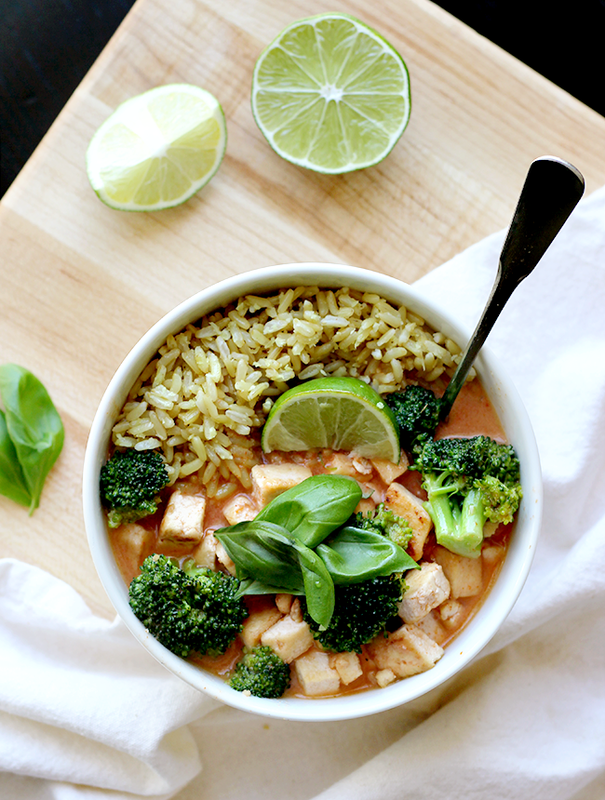 Recently though, I found a way to make a truly delicious version of vegetarian Thai red curry that only requires a handful of ingredients and takes about 20 minutes to prepare. It’s so easy and so good that it’s become a regular weeknight dinner around here. If you like curry dishes, I think you’ll love it as much as we do. Begin by pressing the water out of the tofu block and cutting into cubes. (Or, if you really want to save time, buy it already cubed like I do.) Heat some coconut oil or olive oil in a large skillet (enough to coat the tofu without being too greasy) and pan fry the tofu over medium high heat until brown on all sides, adding a little salt as you go. Once tofu is read, either place into a bowl, cover, and refrigerate until you use it, or continue to the next step while the tofu is cooking. 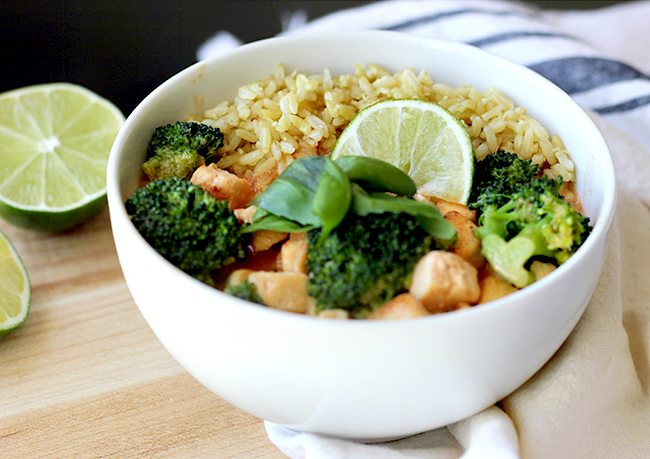 In a medium saucepan, bring coconut milk to a low simmer. Add red curry paste, brown sugar, and garlic powder and stir until combined. 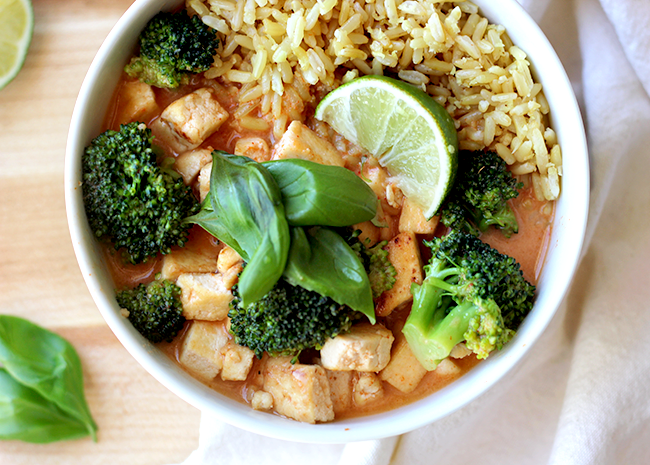 Add broccoli florets and tofu and simmer for about 8-10 minutes. 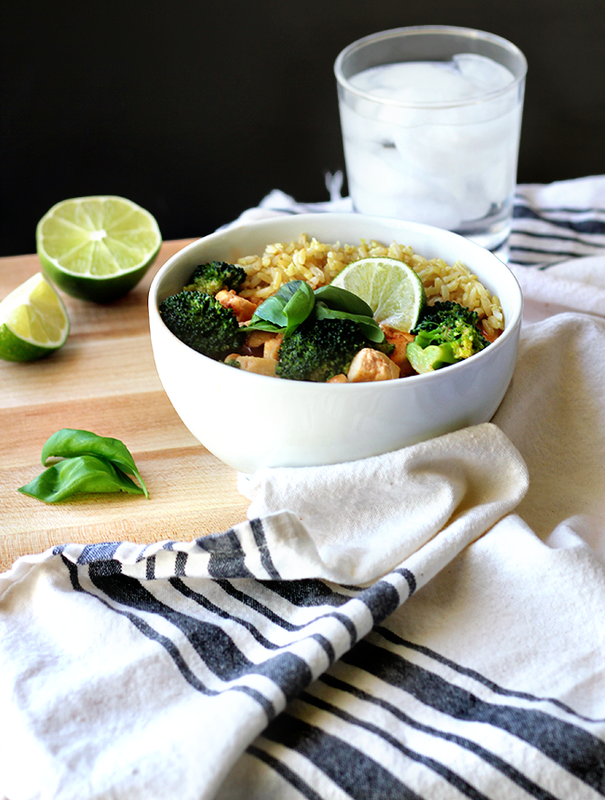 While this is cooking, heat the Village Harvest Organic Coconut Tumeric Brown Jasmine Rice in the microwave for 90 seconds. 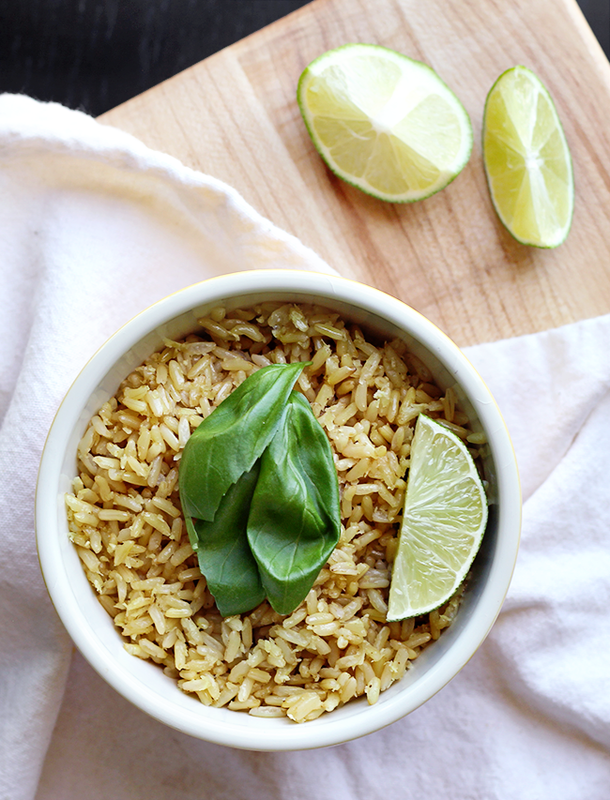 Pour rice into bowls, top with curry sauce, squeeze a little lime on top each bowl and top with basil (or Thai basil). Enjoy! 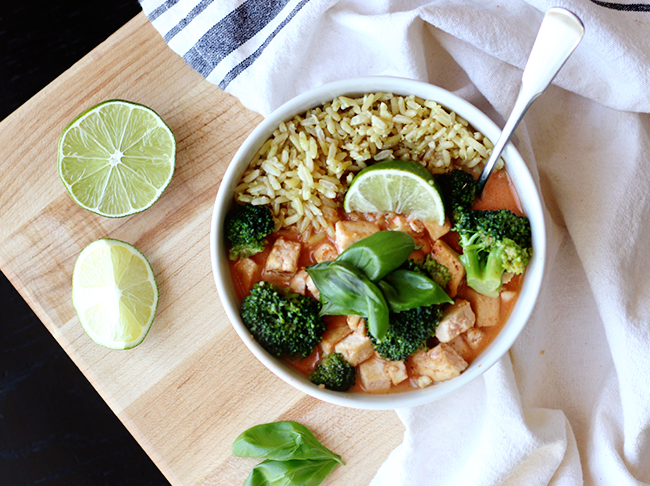 This red curry is super simple and so fast to make, but incredibly delicious. And that’s why it’s truly the perfect quick weeknight meal to prepare for my family. 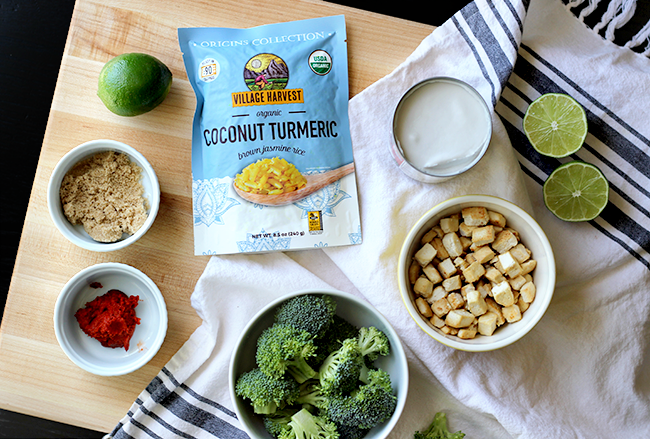 Preparing the tofu in advance and keeping it in the fridge eliminates so much time for me, but the real time-saver is the Coconut Turmeric Brown Jasmine Rice from Village Harvest’s new Origins Collection. 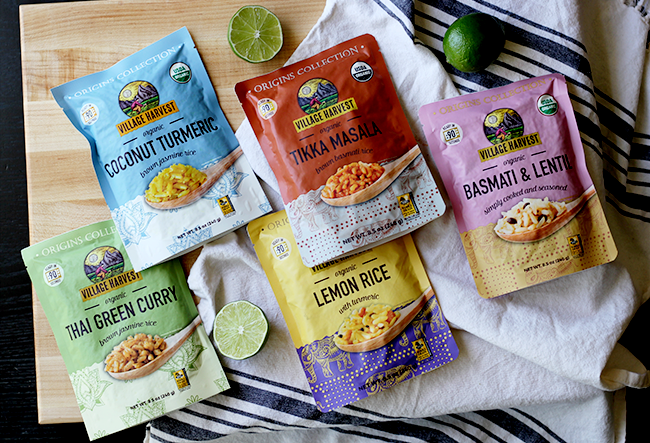 This collection features authentic recipes from India and Thailand that can be served alone or prepared in endless ways, and that are all organic and non-GMO, 100% whole grain, and gluten free. And they’re not just rice – they’re recipes. So you can serve them alone as tasty side dishes, or as part of recipes like this one. Best of all, they’re microwavable and ready in 90 seconds. (This is huge!) My favorite for curry dishes if the Coconut Tumeric (Thailand), but I genuinely love all of the other varieties they offer as well: Basmati & Lentil (India), Lemon Rice (India), Tikka Masala (India), and Thai Green Curry (Thailand). Village Harvest Origins is truly a smart and simple meal solution that you can bring to life in 90 seconds. If you’re anything like me and love delicious Thai (and India!) dishes but don’t have the time to prepare them on the regular, I highly suggest giving this collection a try. And let me know what you think. Any other red (or yellow, or green – I love them all) curry fans out there? What’s your favorite type of Thai food? Anybody besides me remember the children’s book called “I’ll Love You Forever”. I always thought it was kind of creepy because this lady sneaks into her adult son’s bedroom at night to sing her little bedtime song. Somehow, when it’s a pet, it’s not creepy at all! Until next time, Good day, and good dog! This post is in partnership with Samsonsite but all opinions are my own. 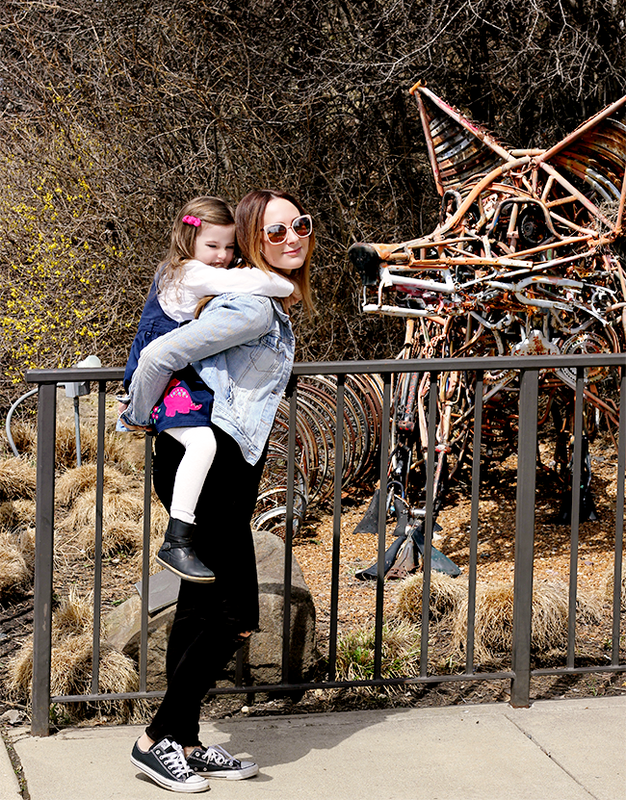 Traveling has been an important part of my life since I was in college, and while both my husband and I worried that we’d have to stop once we had kids, we’ve managed to continue to take trips with our babes several times a year. In fact, both of our kids (now 4 and 2) have been traveling with us – by car and by plane – since they were newborns. That said, traveling with little ones is quite different than traveling on your own (just ask my husband, who works for a band and flies at least twice a week, about the stark contrasts between when he travels for work and with our family!). One difference I’ve consistently noticed is how much more challenging it is to make eco-conscious choices when traveling with kids. When you’ve got children with you (especially little ones), there are more messes, more requests for quick food, more stops, more garbage, and just general excess that ultimately isn’t very good for the earth. When we flew to California a few weeks ago, we really made an effort to make the trip more eco-friendly. And it worked. 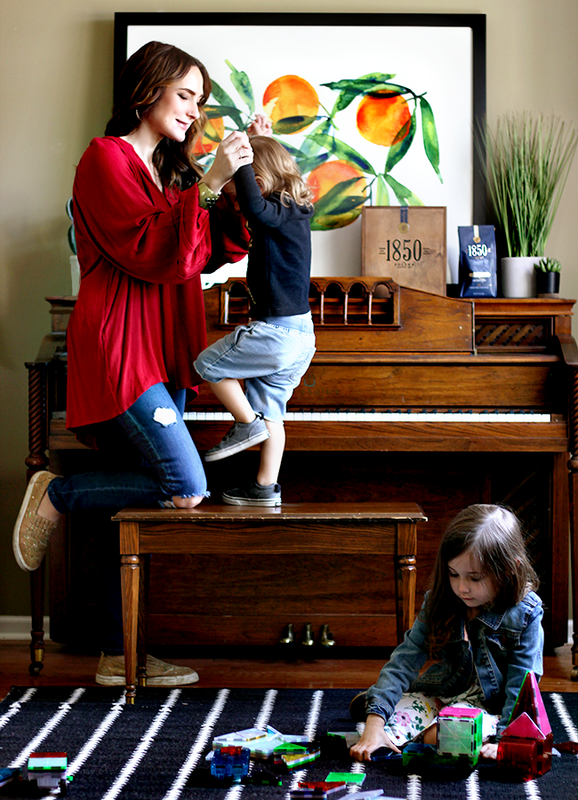 As we near the end of Earth Month, I thought today would be the perfect day to share some of my tips in hopes that it will help those of you with little ones who would like to make your travel more earth conscious as well. 1. Take reusable water bottles. It’s no secret that disposable water bottles are terrible for the environment, but they’re everywhere, and when you’re traveling with kids, they’re admittedly quite convenient. We always bring one of our own reusable bottles for each of us though, whether we’re driving or flying. We fill them up in the drinking fountains at the airport, and if we’re traveling by car, we either fill them at stops along the way or bring a big water jug along with us. 2. Pack snacks from home. We fill reusable containers with snacks for both air and land travel, and for road trips we also bring fruit and sandwiches we make at home. The packaging alone from airport snack shops and/or fast food restaurants is incredible wasteful, and you’ll say some money too. 3. Bring a stroller. Obviously this will only work with little ones, but the great thing about strollers (especially double strollers, like we have) is that you can walk farther and longer than if you’re trying to go on foot with toddlers or preschoolers. And walking is always the best mode of transportation to explore your destination when you’re trying to be eco-conscious. If you have a baby or toddler, a carrier or sling works too. And along the same lines, if your kids are old enough, you can rent (or bring) bicycles as a family and get around that way. 4. 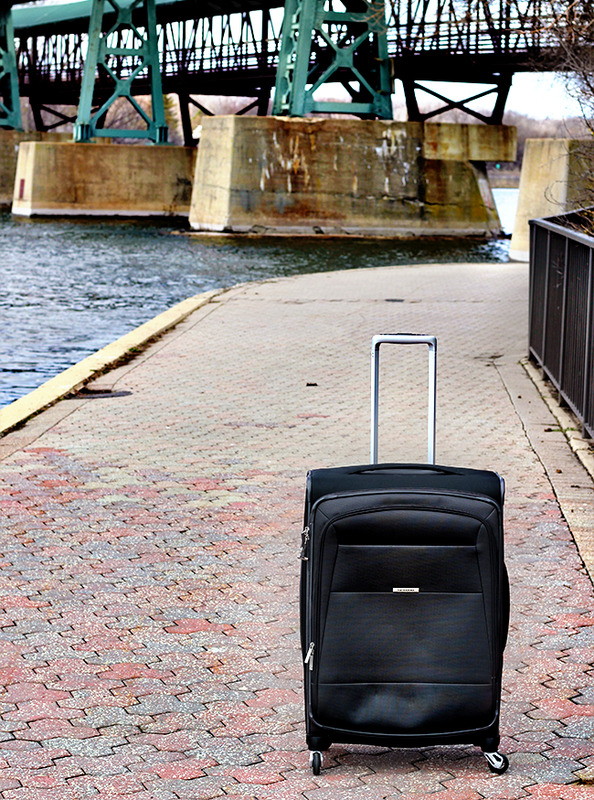 Choose eco-friendly luggage. 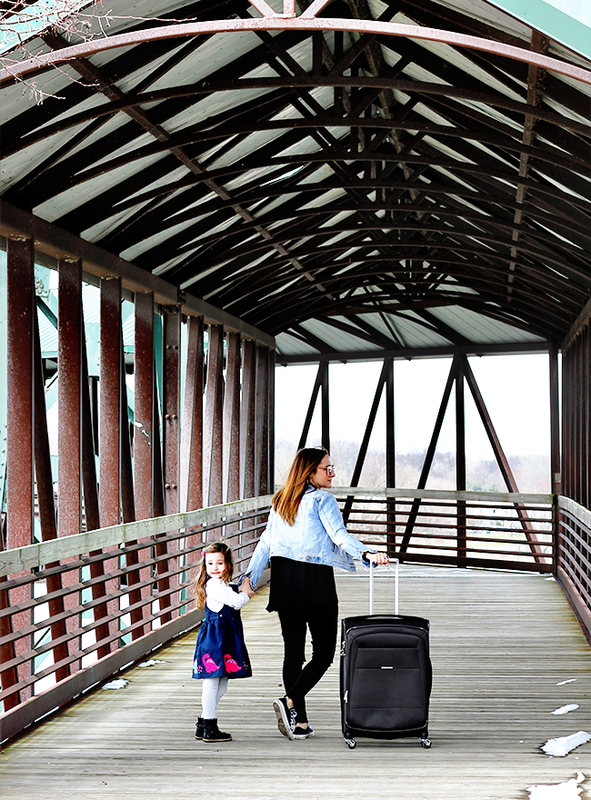 If you follow me on Instagram, you’ve been listening to me rave about our Samsonite ECO-Nu suitcase (we have the 25″ Expandable Spinner in Granite/Midnight Black) for over a month, and for good reason. This is hands down the best piece of luggage I’ve ever owned, and it’s perfect for trips with kids because it’s super lightweight but, thanks to its big pockets and Hidden-Expansion System (which keeps the expansion zipper discreetly tucked beneath the main zipper), fits a seriously impressive amount of stuff. It’s also incredibly easy to transport (which any of you with kids know is key for travel when you’re trying to wrangle a million things at once), thanks to its awesome four wheel Saguro Wheel System. Best of all though, its fabric, including the lining, is made completely from post-consumer recycled plastic bottles. All of it. Bottles are melted down into a liquid polymer, then purified into filament yarn, and finally woven into the high quality, durable fabric that is used to make the ECO-Nu. How cool is that? Our Samsonite ECO-Nu has also been a great way to teach our kids the importance of making green choices when purchases travel supplies. I really love how the line is so clearly designed with both the traveler (whether with kids or alone) and the earth in mind. In fact, we’ve already decided that once the other pieces of luggage we own are no longer usable, we’ll be replacing all of them with ECO-Nu pieces. 6. Visit natural places. Sure, my kids love loud, fancy mega kiddie/family fun center type places, but they honestly love forest preserves and state/national parks (which are infinitely less wasteful) just as much (if not more). We took my daughter to the Grand Canyon when she was 16 months old and she still regularly asks to see pictures from it! Even if we’re just taking a day trip to another town, we get outside and explore nature and other unique characteristics of where we are. It’s amazing what you can find and all of the ways you can teach your kids about the environment that way. 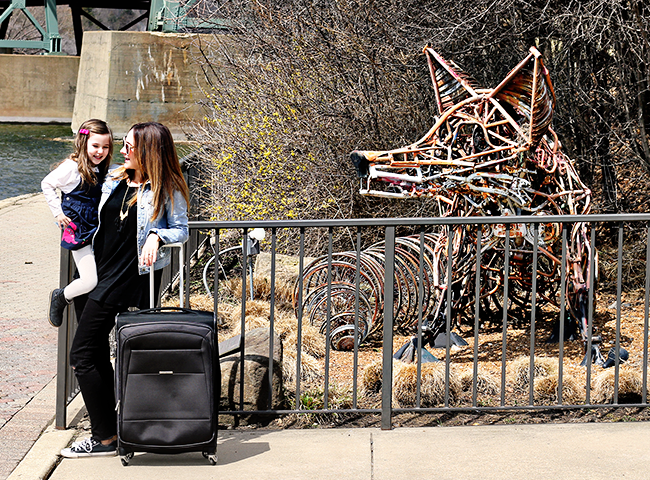 (The fox sculpture you see in some of these photos was made entirely from recycled bicycles. So cool!) I remember reading that people tend to care more about issues if they have personal connection to them, so this is an ideal way to encourage your little ones to care about the earth from an early age. 7. Choose local. Shop locally. Eat locally (especially at places like farmer’s market and food trucks, or farm-to-table and/or organic restaurants). On top of the fact that choosing local is almost always better for the environment because the carbon emissions are much less than products that have to travel far to reach you, your kids will be excited to visit places that are different than familiar chains or that they’re used to frequenting at home. 8. Camp. Full disclosure: we have not yet been camping with our kids, so I can’t say this is a tip I have tried myself. But so many of our friends with older children have camped with them and absolutely loved it, and we’re looking forward to our first family camping experience this summer. Camping uses less energy and less water, and it’s an incredible way to help your kids connect with and develop a respect for the earth. These are all simple, easy ways that can add up to truly make an impact on the state of the earth. 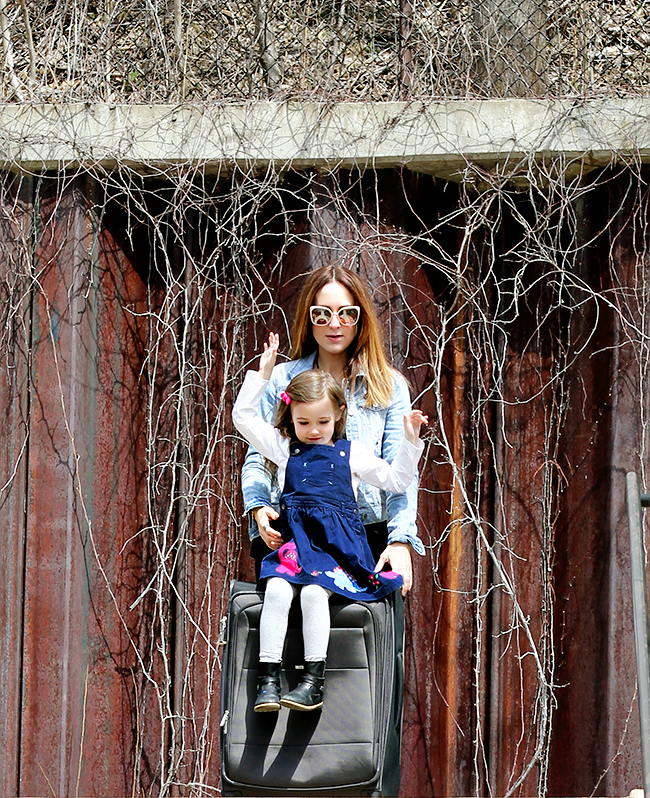 If you have any ways that you make travel with kids more eco-friendly, I’d love to hear them! Yes, it snowed here in Chicago last week, and here I am, clearly in denial, writing about swimsuits. Despite our complete lack of spring here (and apparently in much of the rest of the country as well) however, the swimming pool still opens next month. And summer is my favorite season, so it’s nice to have something to look forward to when you have to pull your winter coat and boots from the back of your closet in mid April, know what I’m saying? I am way into the high waisted bikini bottoms I’ve been seeing around for the upcoming season, as well as all of ruffles gracing suits this year. The pieces you see above are some of my favorites that I’m currently eyeing. I’m especially smitten with #6. That color is everything. Who else is giving this winterish spring the middle finger and swimsuit shopping? Which piece above is your favorite?